We’re back! 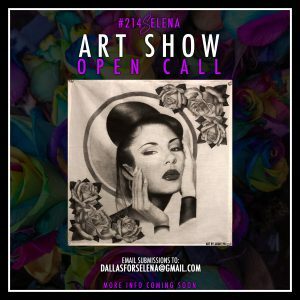 More information on #214Selena weekend coming soon, but we are now taking submissions for the art show. Artists and creative minds alike are encouraged to submit their artwork inspired by the Queen of Tejano, Selena Quintanilla Perez! Artists who’s work has been accepted will be notified no later than Saturday, March 16, 2019. Any questions can be emailed to DallasforSelena@gmail.com.